So there I was at the original spot where I was told the mille crepe craze began. Dropping by the Nedeje Cake Shop at Plaza Mahkota Malacca one fine afternoon, it was indeed a very cozy spot to have some cakes. 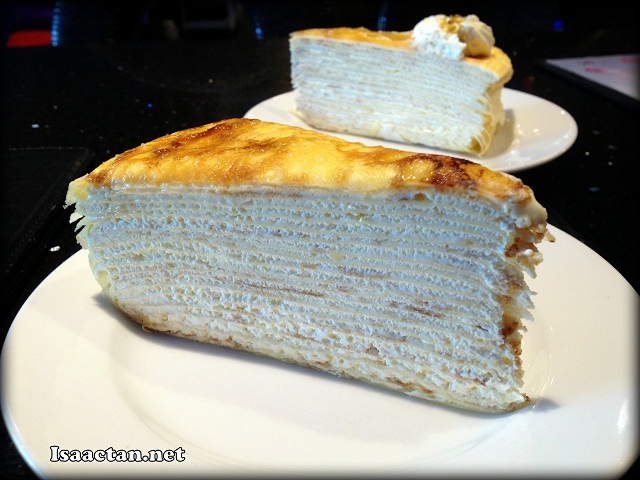 My first encounter with this delicious thing called the mille crepe was way back in 2011 at Food Foundry with friends. I had another taste of it at the Nuffnang Asia Pacific Blog Awards 2011 from Humble Beginnings and I was hooked. Today's writeup would be a "guest" post by one of my friend who was there with me that afternoon. 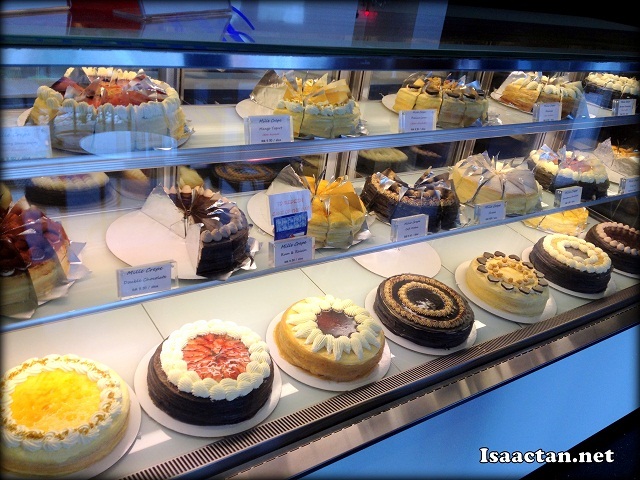 Do check out what my friend had to say about Nadeje Cake Shop Plaza Mahkota Malacca below. Thanks to my friend, who wanted to remain anonymous, this is indeed an easy writeup for me. I have heard so much about the Nadeje Mille Crepe, and finally got the chance to try it out during my short trip to Malacca last week. "Established since 2006, Nadeje prides itself on its quality fresh ingredients and finest handmade Mille Crepe that taste flavourful and satisfying all on its own." Nadeje has 3 outlets in Malacca, namely Plaza Mahkota, Mahkota Parade, and Jaya 99. Since this was my first try, I decided to head to Nadeje Plaza Mahkota which was their first outlet in Malaysia. The location was not that hard to find, thanks to my loyal GPS, it was located in one of the commercial shops just before reaching Mahkota Parade (if you are coming from the direction of A Famosa). Upon reaching, I was tempted with all the delicious Mille Crepes that was stored at a large cake display chiller. Tiramisu, Rum & Raisin, Strawberry, Banana Chocolate, Malacca, and Cafe Mocha were among the choices that made me drooling. After much hesitation, I ordered both the delectable Nadeje Original and Mango Yogurt to savor and satisfy my craving. Had a spoonful of the Nadeje Original, its homemade custard cream with Tahitian vanilla beans and fresh cream easily melt smoothly in my mouth with a rich taste and nice aroma that was so hard to resist. The Mango Yogurt was made from mango, yogurt and cream cheese. It was indeed flavourful with a nice mango aftertaste minus the overpowering sweetness. Recommended for mango lovers! Since the word "mille" means "a thousand" in French, I counted the layers out of my curiosity It has 20 layers, which I later googled and found out it was actually the standard number of layers of mille crepe. The interior concept of Nadeje Plaza Mahkota was worth to highlight as well. 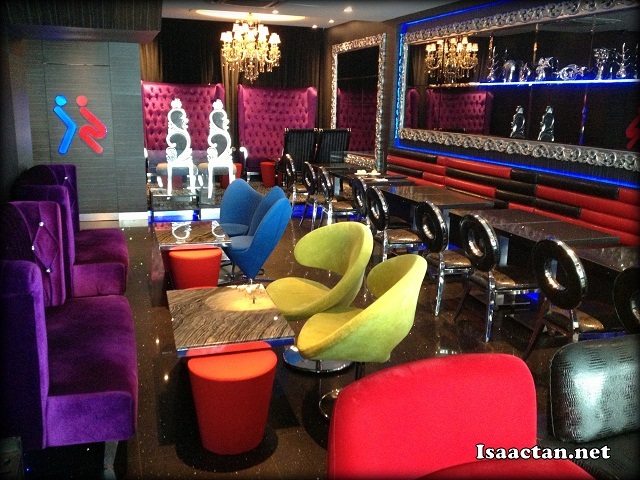 It was decorated in vibrant colors with few sets of trendy designer chairs. Definitely gets you into the mood with pop songs playing in the background for more dessert pampering moment. Overall, it was a good experience, and I have not been to the one in PJ yet, but it would definately be one of my must-try spot in the near future. I'm just too addicted to this thing called mille crepes. Try it, if you haven't already. Used to love it heaps! A passing phase. Getting somewhat bored already so not so crazy over them anymore. Will eat when there's any...otherwise, never mind. I've heard so much about it, but haven't had the chance to try it out at all!!! 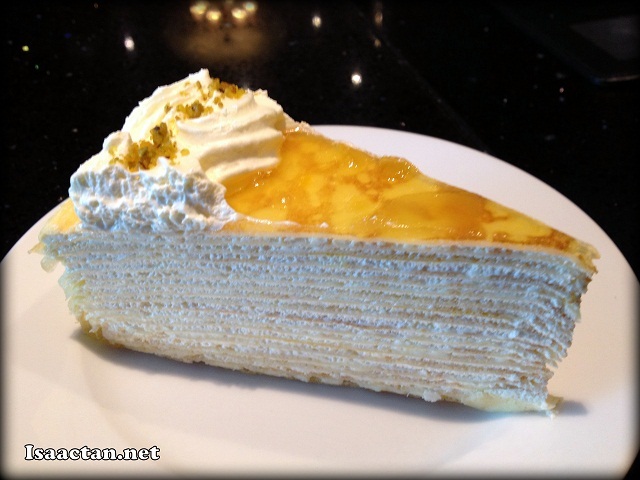 The mille crepe looks so delectable! I've tried the one in KL too hehe it is goood! But I heard Malacca's one not that nice? Hehehe :D Welcome to my hometown. There are so many already, do you think they are still the best? They were definitely the best about 10 years back or so. Took them awhile to come to PJ.